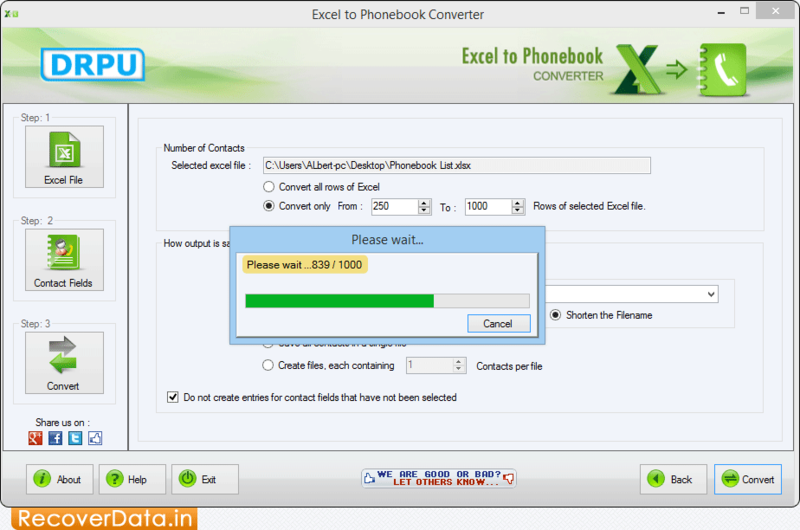 Excel to Phonebook Converter Software is designed to convert multiple number of contacts from MS Excel spreadsheets into phonebook file (VCF) format. Software allows users to import entire or selected contact fields including First Name, Last Name, Company address, Email ID, Contact number etc from excel sheets into phonebook file. You can easily convert contact details from excel sheets into phonebook of your mobile phones without installation of MS Outlook on system. Using this advanced application, you can also import these converted contacts to your social media accounts including Facebook, Twitter, Google+, etc. Software provides facility to skip empty rows and columns in your excel sheet before conversion process. Software migrates bulk number of contacts into phonebook of your mobile phone. Provides option to delete empty rows and columns in your excel sheet before conversion process. Import entire or selected contacts into phonebook for all social networking websites including Facebook, Google+, Twitter, etc. Does not require MS Outlook installation on system to convert contact details from excel to phonebook file format. Compatible with all major versions of Windows operating system.